Once again I was on the hunt for an easy chicken recipe and hit the internet for help. 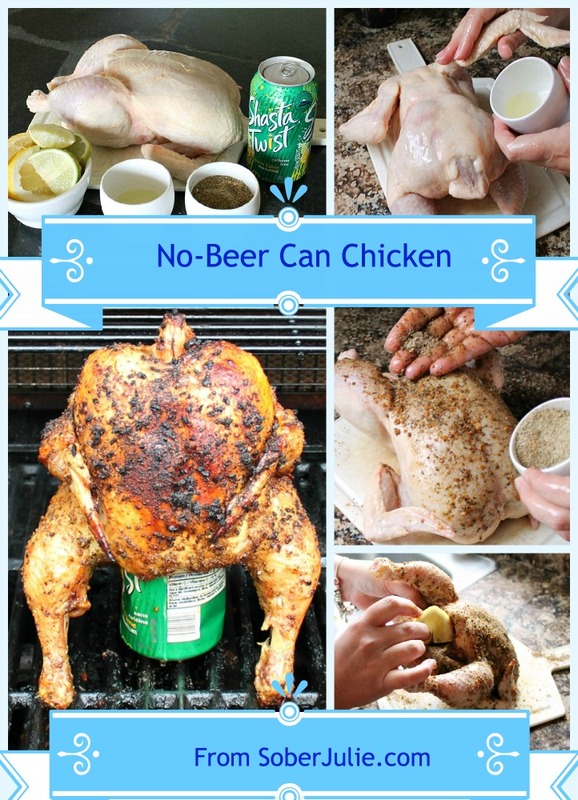 Between Google and Pinterest I had plenty of options but it was quickly apparent that Beer Can Chicken hit the top of the list for many people. This is a recipe which has always intrigued me, put beer and chicken in the title together and it’s sure to draw me in. Alas, my days of ingesting any type of alcohol are long gone (thank goodness) and while I am aware that usually alcohol cooks off during the process, for me it’s not an option. What is someone who chooses to avoid alcohol to do when they find a recipe they want to try but it has alcohol in it? Why they could access my Alcohol Substitution Chart for Cooking to see what options they can use to replace the alcohol. Handy eh? I decided to give the recipe a whirl. After reading many recipes I realized that the rub was the important bit when it came to flavour. Substituting the beer would be simple, I could half fill a mason jar with chicken stock or choose a lemon based soda to achieve the same moist result. 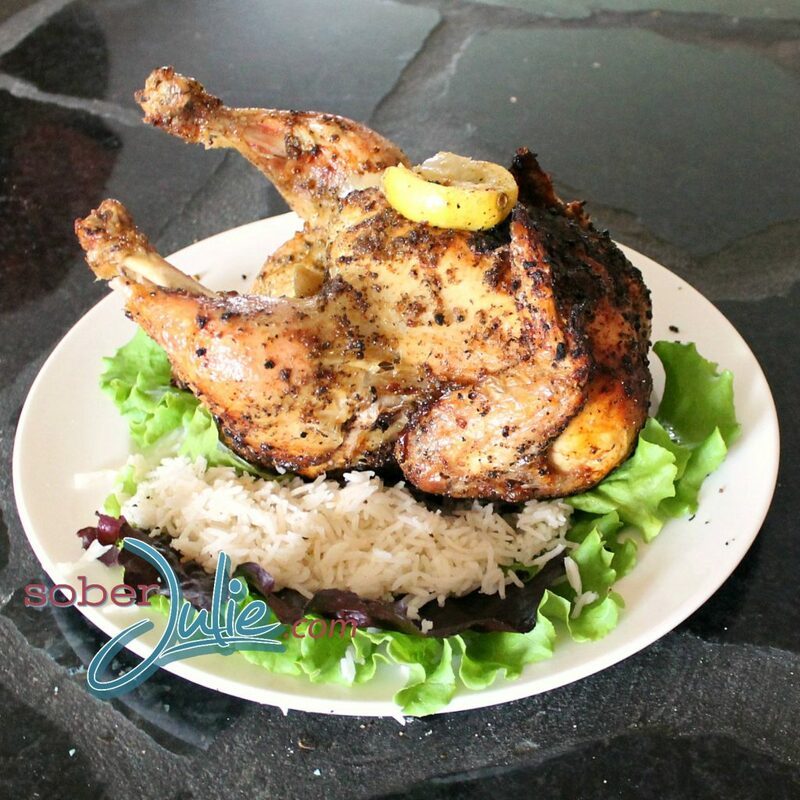 This chicken is cooked with indirect heat (no coals or burners on directly under the bird). This means that you’ll turn your BBQ onto medium-high heat but leave the area where the chicken will cook off. If you have a charcoal grill, just put the coals on the other side and if using gas, leave some burners turned off. Now you’ll prepare the chicken; remove giblets and neck from the cavity of the chicken if they’re in there. Next rinse the bird and pat dry with paper towel, if the skin is moist it won’t go crispy. 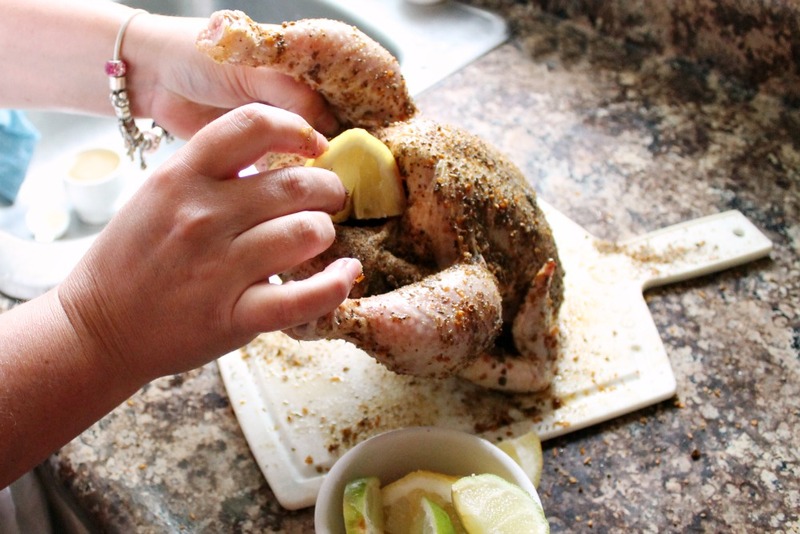 Mix your rub ingredients together and massage the oil into the chicken. 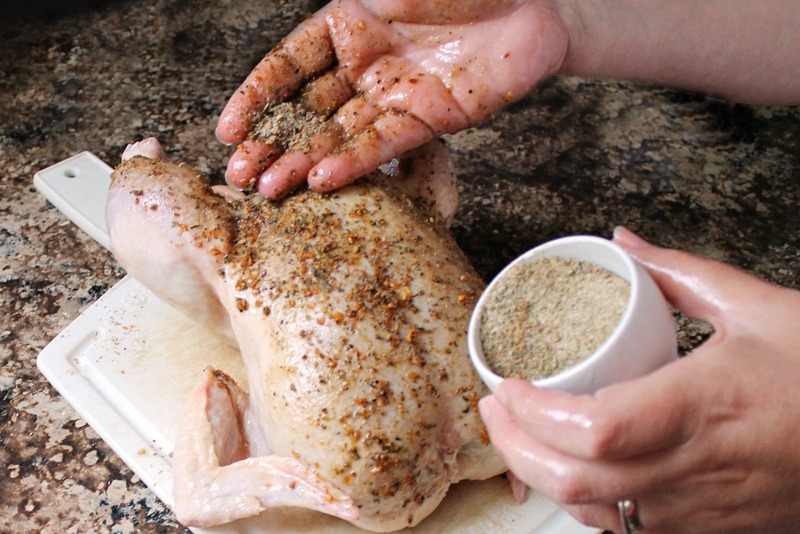 Next rub your spices all over the bird, ensure you get into the folds and cavity. Now take slices of lemon and lime and place them into the chicken’s cavity, don’t over-stuff or the can will not fit in. Place your 1/2 can of soda onto a flat surface and plonk the chicken onto it, this may take a bit of effort but lower the chicken until the can is half-way into the chicken’s cavity. 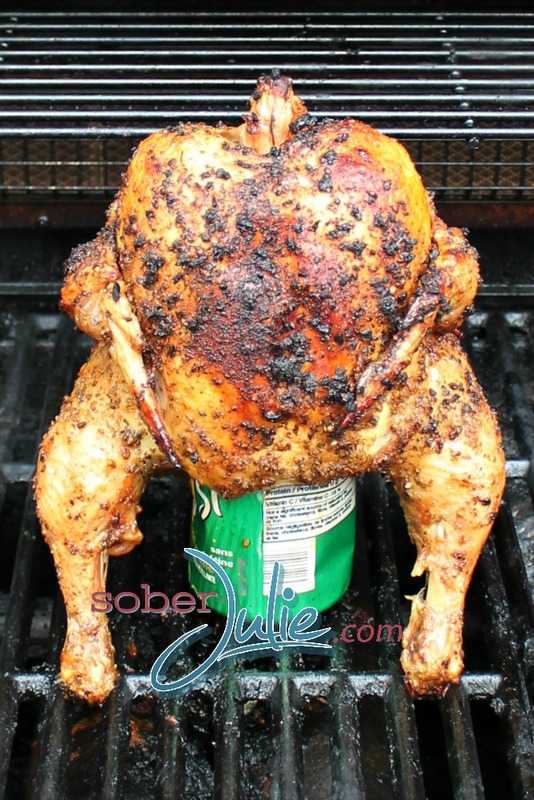 Holding the can in place, move the chicken onto the cooler side of the grill. Carefully place it so that the can sits stably and the legs work like a tripod. Close the lid and allow it to cook for about 1-1/4 hours or until the internal temperature is 165 degrees F in the breast area and 180 degrees F in the thigh. 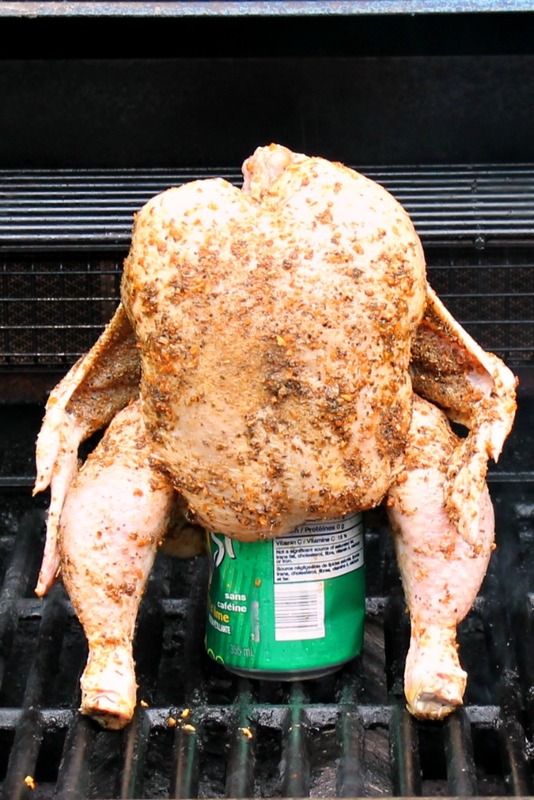 When you remove the chicken from the grill, remember that the can is HOT. We used tongs under the wings and a spatula to hold the can. Simply slide the can out of the bird and serve! I’m going to try this today. 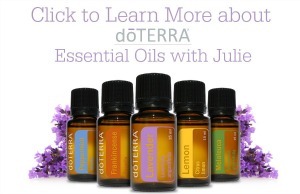 Looking forwodr to trying this. Great substitution and should work out really well! My only concern would be using the mason jar. I had a fired ceramic pan that was supposedly intended to be used instead of the can, and it cracked in half during the cooking. I would be afraid the mason jar might do the same. Better to use the soda can, or one of the metal pans made for this. Totally can relate …not everyone has a can of beer laying around, its expensive to buy one can of beer (IF you can find a bar that does have a beer in a bag, its usually a bottle) I was even debating buying one of those no beer things from safeway …yeah, not near a safeway and dont even know if they make that stuff anymore AND ewwwwwwwwwwww the taste of beer LOL…so gonna try this instead …. Thanks for this! I’m sober 640 days, and we have a hot weekend in Northern California. 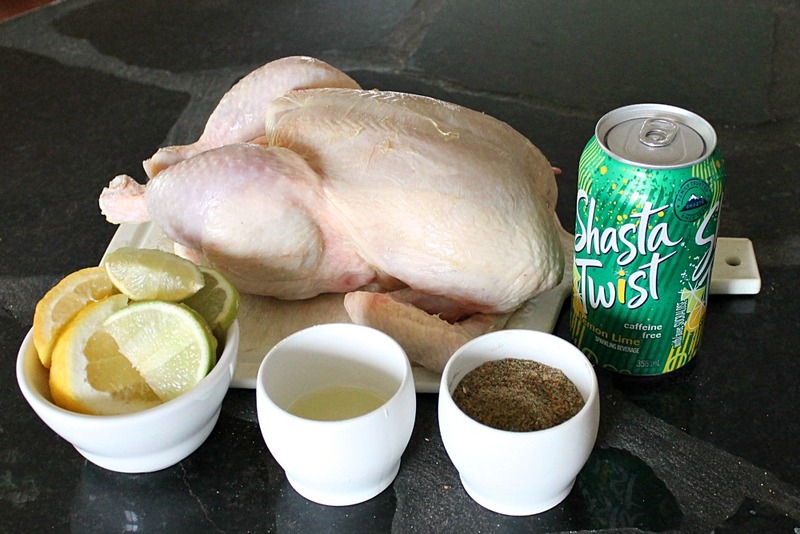 Wanted to make a beer can chicken and this is the perfect alternative. Can’t wait to try.